What’s pink and green and spotted inside? Dragonfruit. If you’ve been to Asia you’ve probably seen this fruit, but did you know it’s the fruit of a cactus? I’ll be honest I hadn’t even heard of this fruit before we got to SE Asia, and even then I looked at it suspiciously the first time. The inner flesh is white with black seeds and the texture is soft, like a kiwi fruit. The taste is somewhat tart, but not very strong. We first ate cactus in Mexico. It was slimy and in a cactus salad the “juice” resembled something like ecto-slime. I didn’t want to touch it again. Looking at dragonfruit I can definitely see it’s resemblance to cactus fruit, thankfully though, the inside is more delicious and less like a prop for the ghostbusters. IF YOU GO: The floating markets of the Mekong Delta are worth the trip, their vibrant, colorful and an interesting peak to life along a river delta. Dragonfruit is found all over Southeast Asia, in fact a tour of dragonfruit countries would make a great list of places to go… are there dragonfruit holidays in Sri Lanka? We spent a day hiking the hills in Tbilisi and after a long afternoon we came upon Narikala Fortress overlooking the city. The views of course were splendid, but tucked on the backside of the church was a small vineyard and an overgrown orchard. The grapes themselves looked delicious but were carefully arranged on trellises as someone’s pride and joy. The small pomegranates however were strangled with weeds and vines and looked as though no one had paid them attention in years. The fruits, just starting to get large in size, peaked shyly from the leaves. Pomegranate’s are native to the region of Persia and the Western Himalayas. In the Caucasus’ they’re mainly used as juice, but are also seen in desserts and salads. An ancient symbol of fertility, pomegranate’s are a widely used in religious art and design, often representing the garden of eden. We were fortunately enough to enjoy fresh pomegranate all over the eastern Mediterranean, but especially in Turkey. This picture was taken at the Narikala Fortress overlooking Tbilisi, Georgia. If you don’t feel like hiking up the hill, it’s an easy ride in a cab. Georgia is a great place for a taste of Europe and Asia, it’s both comfortable and exotic at the same time. We loved hiking through the Mountains of Kazbegi and exploring the neighborhoods of Tbilisi. Although I lost a bit of my innocence there, it’s worth it to stop in at the Sulfur Bath’s in Tbilisi. We went to Georgia after spending time in Turkey, it’s an easy addition to Eastern Turkey holidays. The first time we saw jackfruit in a market we looked at the lumpy enormous “fruit” with suspicion. Fibrous and exotic looking, I wasn’t so sure about trying it, especially after some South African friends of ours that we’re traveling with told us the flavor was “interesting.”Usually about 10 inches in diameter, and weighing up to 30 kilograms, the greenish, bumpy exterior doesn’t exactly invite a taste like the outside of a mango. Nikki and Danny prevailed upon me that it was essential we try it, if only for the blog. In the name of research, Nikki and I searched both Moshi and Arusha for the fruit, unable to find it. Finally walking down the street in Uganda we found it and interrogated a very nice young man for its wear abouts. Handing a huge chunk of jackfruit to Nikki, Godfrey, as with later found out, took us to his “jackfruit”man in an alley. Purchasing it for us so we didn’t have to pay the “mzungu” mark up of at least triple, we sat down with the rest of the crowd to sample. Watching us navigate the pits & flesh the locals laughed at us when Nikki proclaimed “I love it!”. The fruit was sweet and yet bland… not juicy at all, in fact rather rubbery in texture and very starchy. The flavor was good, but as my friends warned me it was “interesting.” I would eat it again, but its not exactly something I’m going to crave. 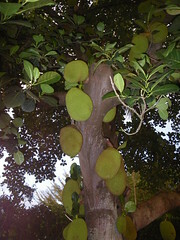 Jackfruit is indigenous to Southern Asia, so its no wonder that we haven’t come across it before. Native to India, jackfruit has been cultivated for thousands of years across southeast Asia, spreading like most things, through the trade routes. It can be eaten raw, boiled, grilled, well you get the picture. Although we never came across it, invasive jackfruit plants have become a significant problem in Brazil. Destructive to endemic plants, the Brazilian government has started a jackfruit eradication program. Maybe we should just send Nikki.